There is always the challenge of eating healthfully. On the road sales people and soccer parents know that living out of your car makes it difficult to eat properly. Some people will go all day without eating then pack in huge amounts of food just before bed while others stop at the drive-through or munch on vending products and doughnuts. Anyone who lives in their car knows what a challenge this is. Nevertheless, with a little foresight and preparation it is possible to eat well on the run by following a few simple tips. To maintain a healthy lifestyle while away from home you can plan ahead and pack your own food. It is helpful to have a small cooler or at least a lunchbox with a frozen pack. There are also refrigerators of various sizes available that plug right into your car. Pack healthy snacks with the right combination of high-quality protein, fat, and carbohydrates. Start the day with a great breakfast. This means protein like eggs, yogourt, milk, cottage cheese, or low-fat cheese. Whole grains like oatmeal, whole-wheat toast, or high fibre-low sugar cereal, and have fruit or juice with your breakfast too. In your hotel room, look away from the mini-bar. At the end of the day when you are too pooped-to-pop the mini-bar can be very tempting. One thing you can do to help resist temptation is to refuse the mini-bar key when you check in. Try to prevent late-night eating because consuming calories at this time is the easiest way to gain weight. Understandably traveling and airport hassles make this difficult, so if you do eat late, opt for a lighter cuisine especially if eating just before bed. It is hard to manage your eating when you don’t have complete control over your schedule, but try to have something to eat at least every three to four hours so you will be in command of your appetite. This habit spreads your calorie consumption more evenly throughout the day and has a positive effect on your metabolic rate. Social or business dinners tend to encourage alcohol consumption. Alcohol is a high calorie source compounded with mixes (a rum and coke can easily be 250 calories!). Another byproduct of alcohol consumption is the carefree association of food. A couple of drinks may make it harder for you to stick to the better choices off the menu or have you absent-mindedly picking several hors’ de œuvrés off the center piece. Try to hold your consumption to one glass of wine and order your meal before you take a sip. Eat out wisely. Have a good plate of food and you won’t need to use bread as filler. If it is a sandwich you want see if they have whole-grain bread and be sure to have a balanced plate of carbohydrates, protein and lots of vegetables. If you choose a salad sometimes restaurants get a little carried away with the amount of dressing they put on it. One way you can control this is by ordering the dressing on the side and just drizzle it over your salad with your fork. This will give you maximum taste with minimal calories. Drink plenty of water throughout the day and with your meals. And dessert? 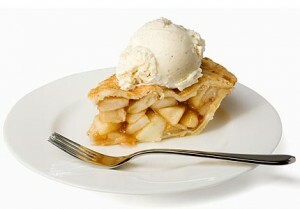 If you are at that grand ole Mum-&-Pop diner with the best apple pie, well, split it with another traveler. Then it will be only half the calories with all the taste. Just as important as your caloric intake is your caloric expenditure. Get in your physical activity. Plan ahead so you know where the health-clubs are whatever your destination. Your hotel may have a decent fitness centre or they may have a free pass to a local facility. Pack your sneakers and workout clothes. While travelling or sitting for long periods it is especially important to get in at least 15-30 minutes of movement to keep your blood pumping throughout your legs and body. So while travelling be sure you are eating healthy on the road and at the end of a tiring day a good cardio workout will help to keep you mentally and physically fit.